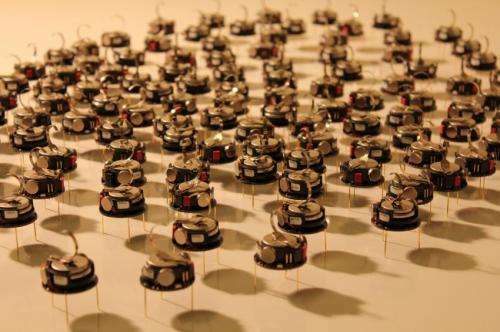 A way of making hundreds—or even thousands—of tiny robots cluster to carry out tasks without using any memory or processing power has been developed by engineers at the University of Sheffield, UK. The team, working in the Sheffield Centre for Robotics (SCentRo), in the University's Faculty of Engineering, has programmed extremely simple robots that are able to form a dense cluster without the need for complex computation, in a similar way to how a swarm of bees or a flock of birds is able to carry out tasks collectively. The work, published today [Thursday 17 April 2014] in the International Journal of Robotics Research, paves the way for robot 'swarms' to be used in, for example, the agricultural industry where precision farming methods could benefit from the use of large numbers of very simple and cheap robots. A group of 40 robots has been programmed to perform the clustering task and the researchers have shown, using computer simulations, that this could be expanded to include thousands of robots. Each robot uses just one sensor that tells them whether or not they can 'see' another robot in front of them. Based on whether or not they can see another robot, they will either rotate on the spot, or move around in a circle until they can see one. In this way they are able to gradually form and maintain a cluster formation. The system's ingenuity lies in its simplicity. The robots have no memory, do not need to perform any calculations and require only very little information about the environment. Until now robotic swarms have required complex programming, which means it would be extremely difficult to miniaturise the individual robots. With the programming developed by the Sheffield team, however, it could be possible to develop extremely small – even nanoscale – machines. The Sheffield system also shows that even if the information perceived by the robots gets partially corrupted, the majority of them will still be able to work together to complete the task. Roderich Gross, of SCentRo, explains: "What we have shown is that robots do not need to compute to solve problems like that of gathering into a single cluster, and the same could be true for swarming behaviours that we find in nature, such as in bacteria, fish, or mammals." "This means we are able to 'scale up' these swarms, to use thousands of robots that could then be programmed to perform tasks. In a real world scenario, this could involve monitoring the levels of pollution in the environment; we could also see them being used to perform tasks in areas where it would be hazardous for humans to go. Because they are so simple, we could also imagine these robots being used at the micron-scale, for example in healthcare technologies, where they could travel through the human vascular network to offer diagnosis or treatment in a non-invasive way." The researchers are now focusing on programming the robots to accomplish simple tasks by interacting with other objects, for example by moving them around or by sorting them into groups. More information: "Self-Organized Aggregation without Computation", by Melvin Gauci, Jianing Chen, Wei Li, Tony J. Dodd, Roderich Gross, is published in the International Journal of Robotics Research.